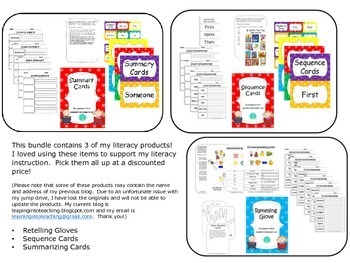 This bundle contains 3 of my literacy products! I loved using these items to support my literacy instruction. Pick them all up at a discounted price! The Retelling Glove is a wonderful way to teach students the qualities of good retellings and give them a strategy that can be used independently. Even if a glove is not available, students can learn to use their own hands to recall the important parts of a retelling. This product includes directions and printables to make gloves out of gardening gloves you purchase, paper hands for students, and response sheets. These Sequence Cards are a great tool to teach students the qualities of good summaries and give them independent practice with generating summaries. This product provides a set of teacher cards, student cards, and several printables. Summary Cards are a great tool to teach students the qualities of good summaries and give them independent practice with generating summaries. This product provides large teacher cards, student cards, and several response sheets.